The one thing that seemed to be suggested at the so-called “boutique” event, was that it was meant to cater for those of us who had experienced the original “Trip to Tipp”. That’s to say, at least among a certain cohort, the suggestion was EP was an event for those of us of a particular vintage, a nostalgia-seeking set who once ran havoc at Féile; the three day, music festival held on August bank holiday weekends from 1990 through 1994, in Semple Stadium, Thurles, Co. Tipperary. This “original” was, for all intents and purposes, a “bacchanalian” event, but maintained the sense that music was at its core. 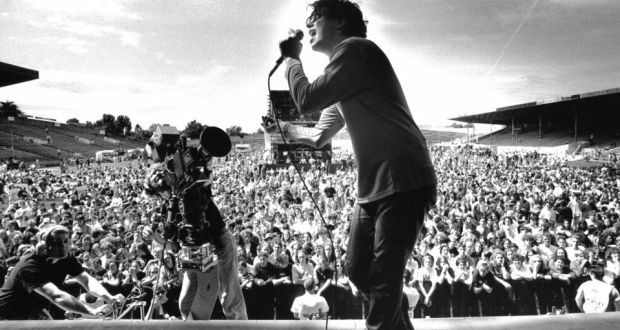 Alternative, independent and new music were at the heart of the Trip to Tipp, before those terms became genres to be marketed by record labels. 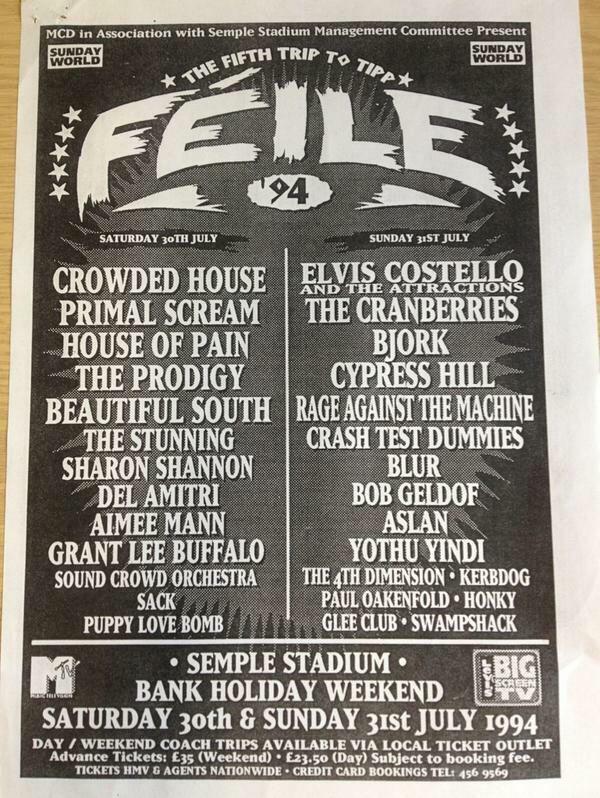 Those of us who attended could not have but a certain musical snobbishness, disgusted as we were (or at least most within my clique were) by the subsequent, unabashed commercial enterprise that Féile became in our eyes. Firstly moving to Cork and then Dublin, sold off like an American sporting franchise, I for one was aghast as any true Dodger’s fan once was when the Brooklyn baseball team was unceremoniously relocated to LA. Something about Féile and the Irish music festival to me and my cohort had died, once it left Thurles. So now that I am a “returned emigrant,” with over a decade worth of vague stories about the EP, I persuaded my very patient wife that this year I must attend; despite being a solidly middle-aged, family man, with two children. Let me stress, when I lobbied for my need to attend, I was firmly in the mindset that I needed to attend if not alone, then certainly with no kids in tow, despite the fact that EP allegedly caters for families. My decision to not bring the children, I would argue was absolutely spot-on, for a few reasons. But let me not digress for the moment. My experience at the Electric Picnic, was indeed, something of a throwback to my younger days, in that while it may not have been the bacchanalian experience of my youth, like Ebenezer Scrooge in a Christmas Carol, what I saw was akin to witnessing what that may well have been like. From muddy fields and mud-covered youths, to half-erected tents, and all night parting, the teenagers and young adults at EP were a sight best not seen by young kids, perhaps. That is not to be critical, or a curmudgeon, for I saw no trouble, no serious accidents or injuries, and witnessed many, many young people seemingly enjoying themselves tremendously; but it is the kind of wanton revelry that should I believe maintain at least a PG14 rating. I said I would not digress and yet I seem to be slipping into a parental voice perhaps. But I do not believe the carousing of EP need be an example to be witnessed by too young a mind or eyes. I will leave the debate aside for now, for it is not a stance I have fully developed. There is so much to be said, so much that can be analyzed of the weekend, especially the escapism it offers on a larger scale than Féile had ever offered. The EP is truly carnival, burlesque, and diversion from the realties’ of Irish life. Given the evolution from Celtic Tiger to bust during its tenure, perhaps the masks, costumes and face paint that adorned the majority are understandable; that is, the one thing that Ireland and its youth have needed these past seven or eight years is a real sense of escape. EP seemed to me to be certainly stunning in that regard; Féile, in my mind, always very much maintained a sense of Ireland, perhaps because of its Tipperary setting and location in Thurles town, Semple Stadium and the race course. Contrastingly, the EP in its very massiveness is labyrinthine; Alice through the rabbit hole; it is truly masquerade. My encounter with EP, by and large, lived up to the hype and the mythmaking, with the caveat that I probably knew what I was letting myself in for to some degree. That’s to say, I was very self-conscious of my own nostalgic hopes and inklings, which I was determined not to let shroud my experience through grumpy comparatives, or quixotic meandering soliloquies (although this may be one now?). The festival spectacle was impressive in its organization, and the mini townland that was created was at first overwhelming. From Trenchtown, to Other Voices, and on into the main arena, slammed by the sights and sounds of the massive fun fair and carnival, one cannot but applaud the set up. 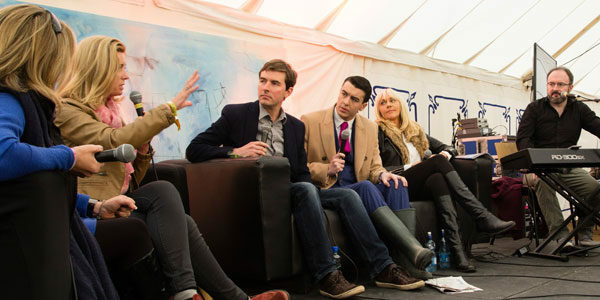 Across to Body and Soul, into Mindfield, the Comedy tent and Casa Bacardi, the stimuli was sensory overloading on day one. And that’s before the music is mentioned. On the main stage, the electric stage, and the Cosby tent alone, the music I saw was truly outstanding. The criticism is one of too many acts and not enough time to get to see them all! It must be like the dilemma Jim Gavin has these days of picking the starting fifteen from a Dublin panel full of talent, with such depth and strength. As a novice (although well chaperoned by a few veterans) my default setting was to stay close to the biggest acts and the main stages. The best of the knowable names perhaps, but my highlights for the weekend were BellX1, The Avett Brothers, LCD Sound System, Noel Gallagher, New Order, Toots and the Maytals, and from the comedy tent the superb Rubberbandits. The biggest disappointment for me were the mundane sounds of The Chemical Brothers; but perhaps my age is playing into my nonplussed reaction to the mere noise they seemed to be producing on this occasion. There was no rush of nostalgia for youth to the dissonance of their turntables on this occasion. But, contrarily, the melodic sounds of the Avett Brothers, the pop-ness underscoring BellX1, and the playful folksiness of Nathaniel Rateliff and the Night Sweats combined a sense of something novel with something familiar to my musical ear; these three alone were worth the strain of the unaccustomed late nights in our trailer tent abode. What more is to be said? Electric Picnic was a breath of fresh air, given the daily routine and conversations, for us middle-agers at least, which are largely around the ineptness of our political leaders to run the country; the apparent irrelevance of Ireland as a republic, when the government represent vested interests like saving Apple Inc. billions of dollars, while ordinary people are humiliated daily; in our third world health care system; by the lack of home grown jobs, and indeed by being coaxed to seek work abroad; or being stripped of their dignity when it comes to trying to find a home or even mere shelter. If only the organizers of the festival ran the state, perhaps? But mostly, the EP’s escapism is worthy of the experience, despite lending itself to a sense of that double-edged sword and being lulled into the premise, “well isn’t this a great little country to have the EP;” yet it is worth a look, for its music, its inventiveness, its carnivalesqueness. Of course one wonders and worries at the EP’s growth and the skepticism that raises questions about whether it will become something negative down the line, because of its size? As witnessed at the start of September 2016, nonetheless, entices me to go again; for at least one more year. To check out more amazing photos from this year’s EP check out their gallery here.